The past year, I’ve been working on a not-so-little project, and I’m finally ready for the big reveal! 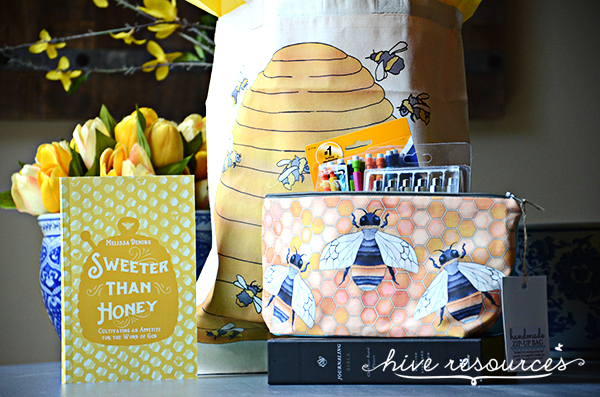 This week, I opened an Etsy shop called Heart and Hive. 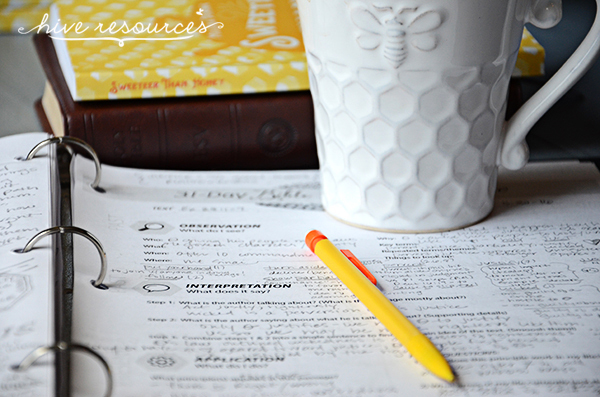 If you’ve been a Hive Resources reader, you’ll know that studying God’s Word and equipping others to read and teach the Scriptures is my heartbeat. Instead of posting here on the site, Instagram has become my main communication vehicle (partly because it is easier, and partly because it has waaaaaay more positive vibes). 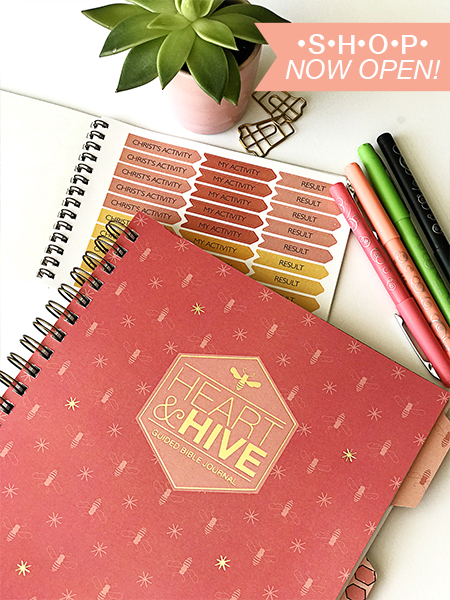 But after getting lots of emails about my Bible study templates, I decided to open a little shop and share them with you! 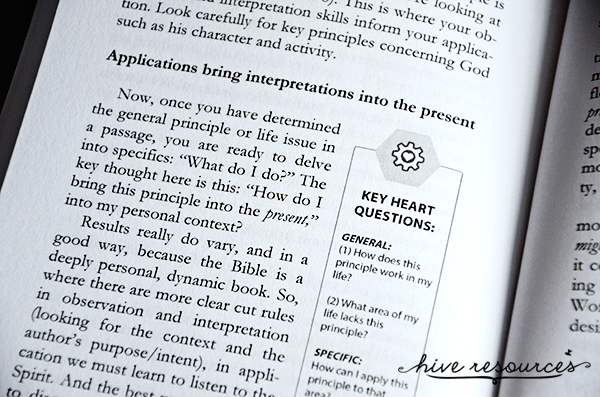 You’re probably asking: “What is a Guided Bible journal?” Easy! 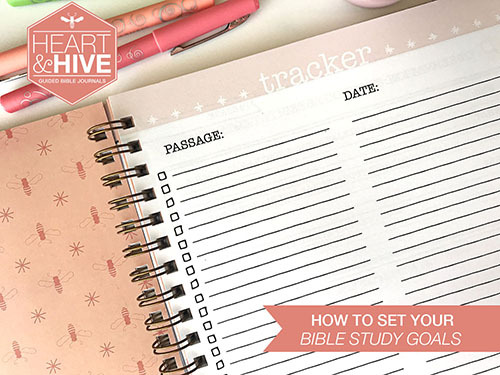 It’s a Bible journal that “guides” you through the process of studying a passage. 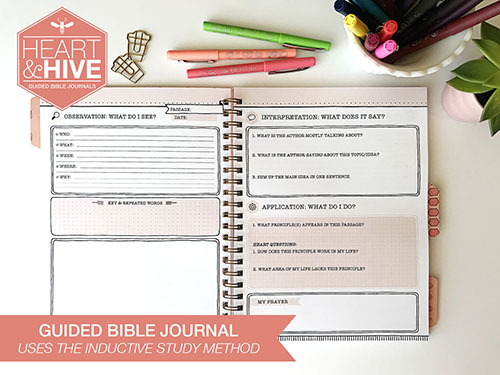 The journal follows the inductive Bible study method, which I detail in my book, Sweeter than Honey. Study pages are organized into the three main parts of the inductive study method – observation, interpretation, application. 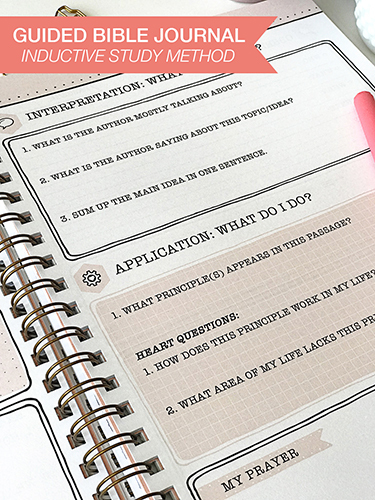 But don’t worry, these steps are made easy because my template “guides” you through each of these steps with key questions and study prompts. The journal includes 90 two-page spreads that are not dated, so you can use them to study any passage in the Bible. And, because you know my love for making all things pretty, I gave you lots of room to record everything you uncover in a passage. 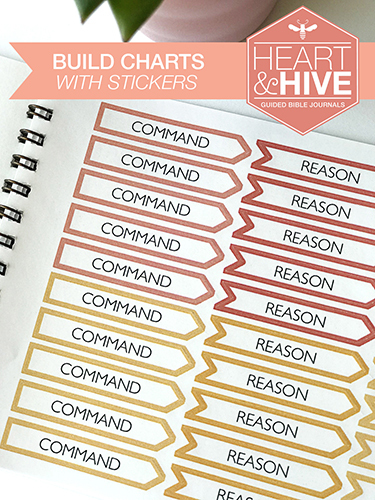 I even included a large blank box so you could make a chart, doodle, or letter a phrase. Well, you’re right. You probably don’t. But anyhoo, we’re going with it. 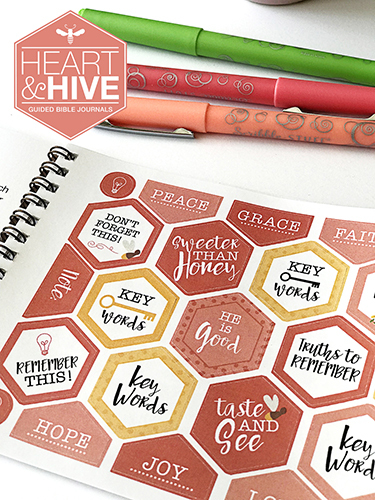 Along with brightly-colored icons and inspirational quotes (things you might find in other faith-based sticker sets), the Heart and Hive Sticker book includes colored headers and a variety of dotted lines to use for making charts in your notes. 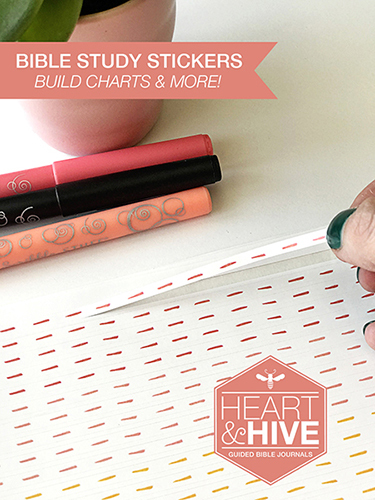 Making charts is actually a huge part of my Bible study process. It is incredibly helpful for me to chart out what I see in a passage, so I can visualize the overall progression of a story, theme, or even a command. I blame veteran Bible study teacher Howard Hendricks. His book, Living by the Book, explains how charts can help you find the author’s original intent in writing a passage. So, maybe Martin Luther wouldn’t approve of the stickers, but Hendricks just might. Maybe. At least my Mom does. (She’s already signed up to buy 3 sticker books for her friends). Stop by my shop! 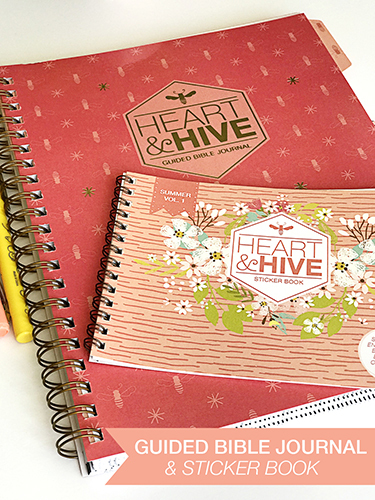 And be sure to follow Heart and Hive on Instagram for some creative ideas and tips! I’ve been biting my nails, anticipating today, like it’s Christmas morning! 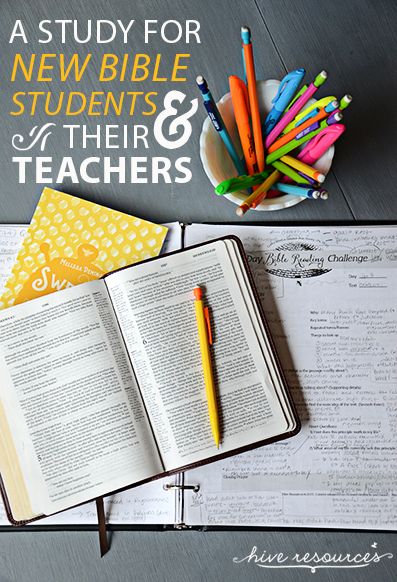 Because today, I’m launching my new Bible study geared for new Bible students and the teachers leading them. And I have a really big, really sweet gift to give away! 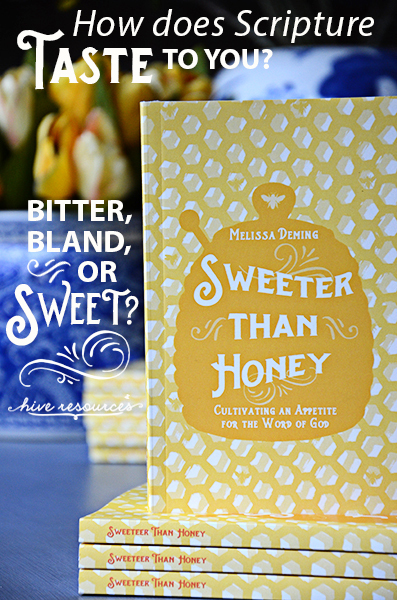 Sweeter than Honey: Cultivating an Appetite for the Word of God is a five-week discipleship guide based on Psalm 19 that offers first-time Bible students and their teachers hands-on cooking lessons for feasting on the Scriptures, helping them become women of the Word. Part 1 helps women cultivate an appetite for God’s Word and the One whom the Bible is about, Christ, the Living Word. Part 2 contains simple and practical steps for self-feeding on God’s Word despite busy schedules or the lack of a biblical ground. Great books on how to study the Bible abound. 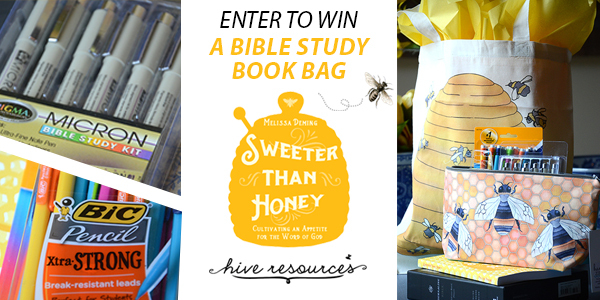 But what sets Sweeter than Honey apart from the rest is it is also written for Bible study teachers and women’s ministry leaders – particularly first-time teachers or leaders who are discipling women from an unchurched background. 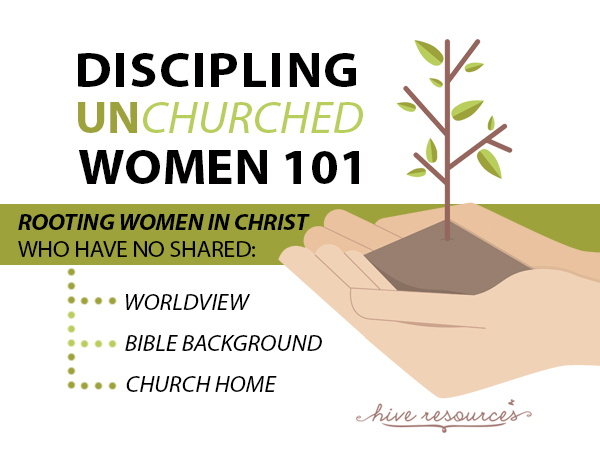 Discipling unchurched women looks differently from discipling women who have grown up in the church. 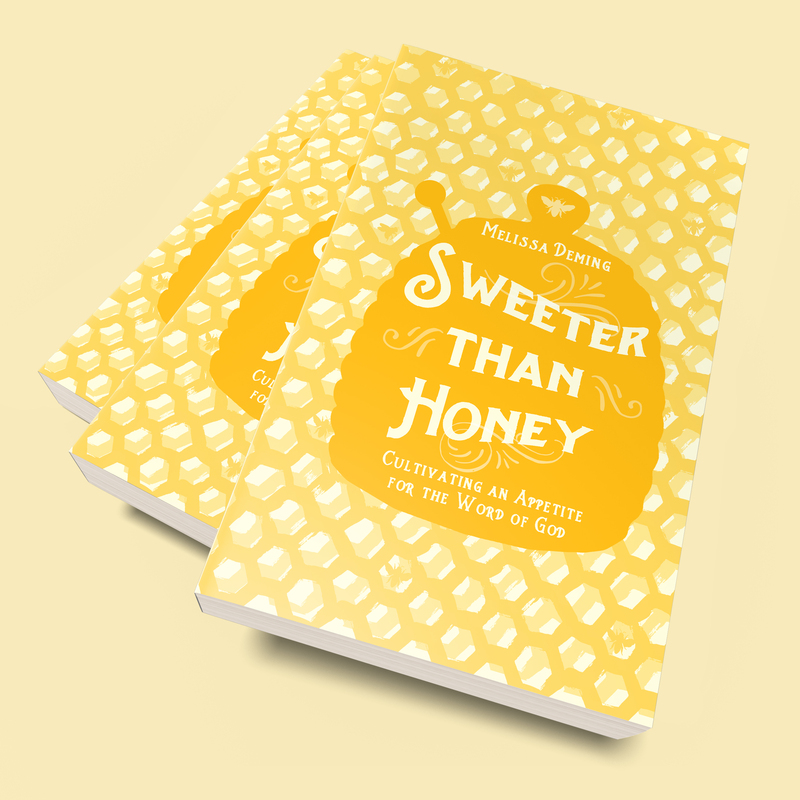 Sweeter than Honey takes those differences into consideration and, together with the free Leader’s Guide, offers teachers a step-by-step guide for helping new believers learn how to prepare a meal from God’s Word. Sweeter than Honey is for any woman who wants to become a woman of the Word – a woman who craves the sweetness of the Scriptures because she has tasted the sweetness of her Savior. It is my hope that this book both encourages you and equips you to nourish yourself on God’s Word each day and to invite others to his lavish table! This week, I’m giving away a complete Bible study bag packed with of everything you need to cultivate your appetite for God’s Word! Trust me when I say that it is truly a measure of my love for you that I’m able to part with this adorable bag and pencil case. On multiple occasions, the honeybee-obsessed troll that lives in my head offered up a surprisingly well-reasoned defense on why I needed it. 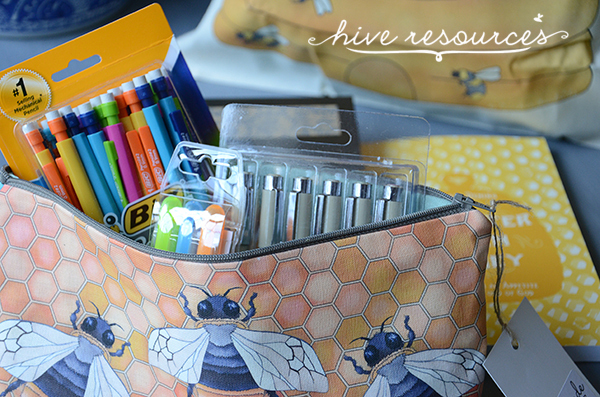 I mean, the teal polka dot lining on the pencil case almost did me in. I hope you feel loved. Enter below! Contest ends July 4 at midnight! HAS ENDED! Congrats to Norma B! Thank you to everyone who entered! If you didn’t win, keep your eye on my instagram account. I might have a few little FLASH FREEBIES in the coming weeks! To download the Leader’s Guide or to find out more, visit the book page. For information about the affiliate links in this post, click here. I would love nothing more than to have you believe I am a discipleship expert. Undoubtedly, I’m not. I’ve made, and will probably continue to make, innumerable mistakes in helping women root themselves in Christ. However, there is one failure in particular, that haunts me. And each time I step forward to lead women in discipleship or to open my Bible to share a message to women’s groups, the memories of that failure are called to my mind. It has taken a lot to heave those heavy burdens of pride and guilt from my shoulders and leave them at the foot of the cross. A number of years ago, I had the privilege of discipling a woman who was new to Christ and his church. Bright-eyed and beautiful, the woman was fresh from her salvation experience and eagerly entered into a discipling relationship with me, and I was excited, too. For the first month, we worked through a bright yellow discipleship booklet that outlined a believer’s next steps in her journey of faith. 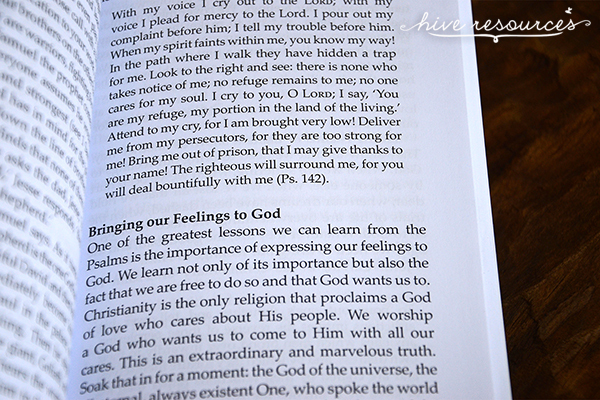 Each chapter covered a basic step of obedience – praying, attending church, Bible reading, tithing, etc. The material was dry, but we worked through each chapter together over coffee. Over time, however, I noticed her waning interest in delving into anything substantial, including reading her Bible on her own. We started and stopped meeting consistently together due to her schedule, and each time I let her set the terms on when we met. I tried to encourage her by continuing to text her and even offered to come pick her up for discipleship sessions, which she agreed to a few times. Eventually, we stopped meeting altogether. I was embarrassed that I had failed so miserably, but mostly I was sad, because I knew that the joy of her salvation had long since subsided. Much of her life decisions were geared toward obtaining and sustaining that elusive emotion, instead of learning to abide in the strength and wisdom of Christ. As she operated on the fumes of happiness, a few more women tried to come alongside her. Eventually, however, she became uprooted from the church altogether. She became what Barna calls many of the women in our church culture, de-churched. There isn’t a passing day that my thoughts don’t return to this lovely woman, praying for our Maker to call her back to him gently, asking that the seed he planted in her heart long ago will one day take root and bear fruit in spite of my ineptitude. I could give you many reasons our discipling relationship fizzled out, and they all begin with me. Don’t get me wrong, I know this woman is ultimately responsible for her actions and attitude toward the God of her salvation. But as a discipler, I believe I, too, bear a great responsibility in her inability to grow and thrive where she was planted. First, I assumed I knew what she needed. I failed to take into account that discipleship would look differently for her than it did for me. Instead of taking the time to evaluate her needs, I discipled her according to mine. I discipled her the way I was discipled (using the little yellow booklet). While she was drowning in a pit of uncertainty over her personal purpose and identity, I was busy giving her a to-do list for being “a good Christian.” In assuming I knew what she needed, I inadvertently made discipleship about me instead of Christ. Second, I failed to speak the truth in love. Whether I was guilty of extending too much grace, or I was simply too scared to speak truth, I never lovingly confronted my disciple about her growing spiritual apathy and the behavior that ensued. Instead of being a teacher and leader, my passive role took the shape of a friend rather than a teacher who held her student responsible for sin. I wish I had asked better questions sooner in order to draw out the lies her heart was pursuing and to push her toward Christ. Third, I sought help too late. By the time I reached out to my pastor for wisdom and guidance, it was already too late. Discipleship is a function of the body of Christ; it is the mission of the church. This truth sheds light on the ugliness of my failure in two ways. In proceeding as I saw fit, I was cutting myself off from both help and accountability. I discipled this young lady without a circle of support from the church to pray for me and to whom I also should have been held to account. In doing so, I made myself, and my disciple, vulnerable to Satan’s attacks in the process. I failed to impress upon her the necessity of being rooted to the body of Christ. Shortly after our discipleship relationship came to an end, I realized my church was brimming with women like her. Women who had recently received the seed of salvation, yet still lacked the robust roots of a Bible background or Bible knowledge needed to survive in hard soil. I watched as a few more women became uprooted from our church soon after their conversion experiences because they weren’t discipled or they weren’t being discipled adequately. Because the soil in which these women had been planted was rocky and bereft of any nutrients, they needed more than simply a to-do list for how to act like a plant. They needed real training on understanding their purpose and place in the body, how to draw nutrients from the Scriptures, and the importance of their spiritual health for the other lives around them. We covered the first topic (a woman’s identity in Christ) as a five-week class, following Ephesians 2:1-10. The quickest way to build healthy roots is by teaching women what Christ has done in and for them, NOT what they are supposed to do next. This helps ground women in truth before rushing them to the fruit bearing phase of discipleship. Giving women a to-do list immediately after their salvation event too easily tempts them to manufacture the fruit of obedience in their own strength, without first understanding the purpose and power for such obedience. We offered this class over five consecutive Sunday nights, intentionally keeping the class duration short so as not to flood newer disciples with knowledge. However, there was an additional benefit to keeping our class length short. I hoped the class would be simple enough for them to replicate with their own disciple at a later date. In this class, we had many mature believers who had never discipled anyone; they, too, benefited from learning some new tools for helping the women around the flourish. We offered the second topic (how to study the Bible) as a weekend retreat that included five teaching sessions based on Psalm 19:7-11. There were benefits to this format as well, particularly for busy moms who had trouble committing to a weekly study. The third area (kingdom living) followed the final chapters of Matthew. I taught it at a weekend retreat, again in five sessions. The progression of this training was very intentional. We wanted to ground the women in the truth of who God is and what he did in their lives through salvation so that when the positive feelings of their conversation experience evaporated and difficulty came their way, they would be anchored in the Word and the church. Next we moved to how a woman can nourish herself on the Word so that she can further cooperate with the Spirit’s growth in her life. Lastly, we sought to open her eyes to her greater role in the church and how to walk in obedience through his Spirit. Because I couldn’t find teaching material specifically for unchurched women, taking into account their need for simplicity and clarity, I ended up writing my own and publishing it on Amazon as a discipleship series. I’m including it here because many women enjoy a guide to discipling others. However, simply following the passages we used would work as well – Ephesians 2:1-10, Psalm 19:7-11, and Matthew chs. 19-28. 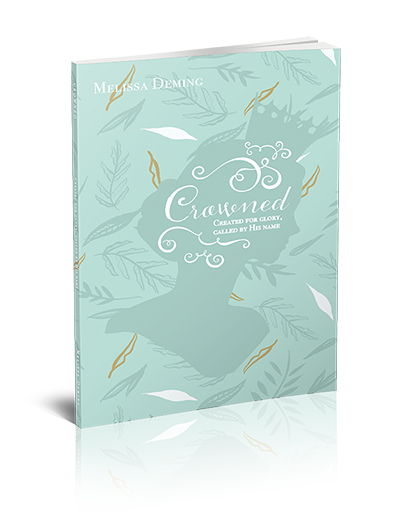 Crowned: Created for Glory, Called by His Name is the first study on a woman’s identity in Christ and outlines five truths of salvation in five short chapters. More than simple doctrine, Crowned looks at the larger story of the Scriptures (Creation, Fall, Redemption, and Restoration), outlining God’s redemptive plan for us and the world. Sweeter than Honey: Cultivating an Appetite for the Word of God is the second book in the series. The first two chapters cover the trustworthiness of God’s Word and how it transforms us into his image. 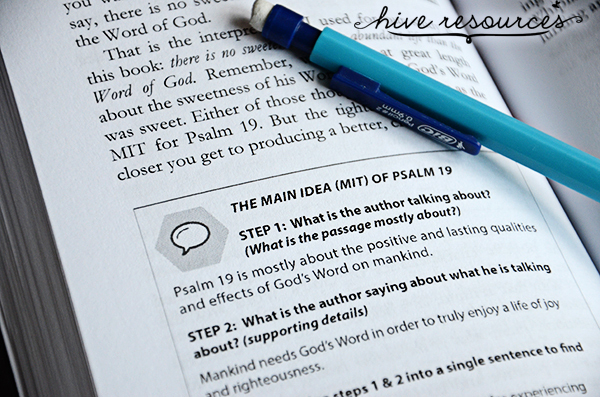 The final three chapters outline an easy, replicable three-step method to studying God’s Word. It ends with a 31-day Bible reading challenge of the book of Matthew. The Kindle version of this book is on Amazon now, and the paperback copy will be available next week! Kingdom Hearts: Becoming a Servant Who Lives and Looks Like the King is the final book in the series and will be available next year. This study looks at how modern women are called to live as servants in light of their identity and role in the church and the kingdom of God. I am the last woman qualified to write any of these books. In fact, if I were to write a best-selling book, it would probably be titled: 101 Discipleship Mistakes to Avoid. Looking back, there are a million things I would do differently in discipling many of the women God has placed in my path. Mainly, being a disciple has impressed upon me the greatness of my need for him and his church. Being a discipler is costly. It will cost you time, energy, and most certainly, your pride. Being a discipler means standing ready to be used and reproved at the same time. It means, never ceasing to live as a disciple yourself as you learn from failures and mistakes along the way. What discipleship failures are you struggling with? What helped you place them at the foot of the cross and what have you learned from them? I’d love to hear so we can encourage one another in this messy thing called discipleship. Today, I’m thrilled to share a book with you that I’ve been waiting to be released for a long time! Written by my friend Christina Fox, A Heart Set Free: A Journey to Hope Through the Psalms of Lament, is a book for weary-worn souls. It is a book for all women struggling to understand how their faith in Jesus Christ intersects with life’s difficult moments. It reads true to Christina’s character and personal story of how a specific group of Psalms in the Scriptures helped her to overcome emotions that threatened to shipwreck her life – depession, anxiety, despair, and more. Christina starts her book where all good stories begin – in the Garden. The entrance of sin into God’s creation corrupted all things, particularly the human heart. Because of that, A Heart Set Free, is more than a guide to cultivating healthy emotions; the book challenges readers to use biblical tools (the Psalms of Lament) to voice and identify the emotions that hold them hostage so that they might live and walk in the freedom of Christ. Newer believers might be unaware that there are songs classified in the Scriptures as laments. A lament is a type of song that honestly expresses the deepest cries of the human heart – cries of sorrow, fear, anger, anxiety, depression, suffering, pain. More than simple venting, the laments offer modern believers a guide for pouring out their hearts to God so that they might find hope in him. In the book, Christina outlines 5 reasons the Psalms of Lament offer hope in the midst of spiritual and emotional darkness. (1) They help us express our feelings in honest and healthy ways. (2) They help shape our feelings, helping us interpret them in light of God’s redemptive plan for the entire world. (3) They teach us more about ourselves by revealing our greatest need and how our minds and hearts influence our lives. (4) They teach us more about God, his character and activity in us and the world. (5) They reorient us to the truth of the gospel and how it transforms us from the inside out. 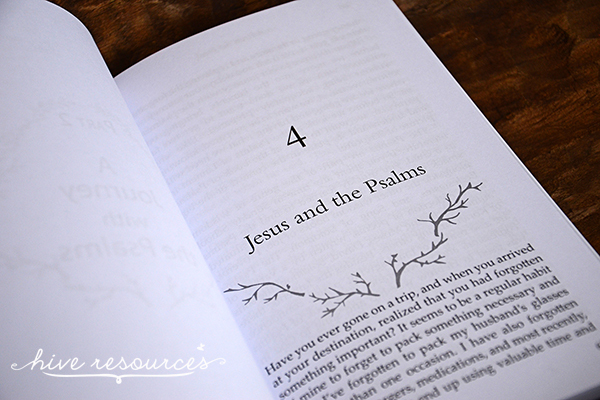 Part of the power of Christina’s book is her own personal story of interacting with the laments, particularly in writing her own laments using the pattern and language the psalmist provides. A Heart Set Free is the vulnerable story of how Scripture is redeeming the heart of one woman and the hard work heart work is. It is a journey that I suspect will resonate with countless believers struggling with depression and anxiety. 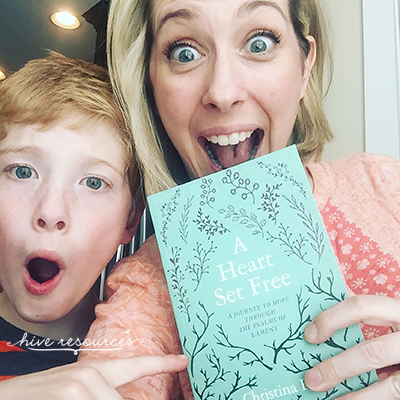 Christina has been working on this book in both her head and heart for a while, and after seeing the finished product, I can’t recommend it heartily enough. Fortunately, she has graciously provided a free copy for one lucky Hive Resources reader! And because the Psalms are one of my favorite books in the Bible, I thought I’d pair her book with one of my other favorite things: coffee! 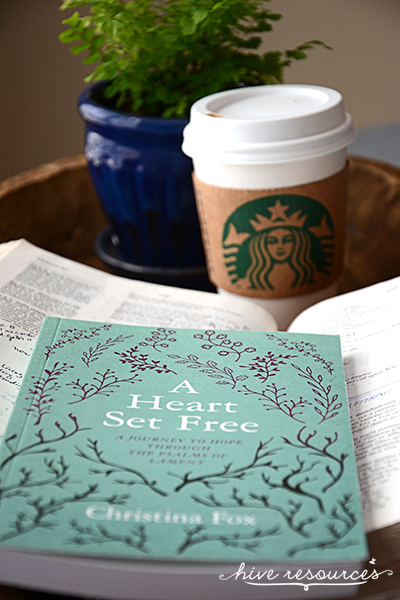 To enter to win a copy of A Heart Set Free and a $15 Starbucks gift card, simply leave a comment in this blog post. That’s it! Pretty easy, right? 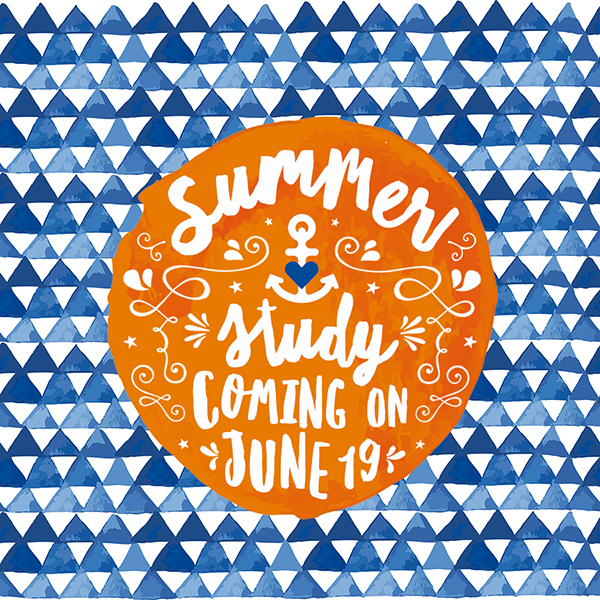 Comments must be posted by Tuesday, May 31 at midnight! (U.S. Residents only). CONTEST HAS ENDED! Congratulations to the winner, Gail Hein! Thank you to everyone who entered! 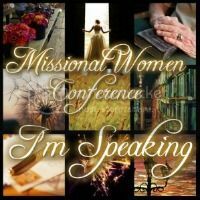 One of the biggest mistakes I ever made in ministering to women was assuming that discipleship is one-size fits all. Depending on where you live and to whom you’re ministering, discipleship will look differently even as the biblical principles for it remain the same. Simply put, discipling unchurched women looks different from discipling women from a churched culture. What’s the difference? Certainly, not the condition of the heart; Scripture tells us we are all sinners in need of a Savior and Christ’s righteousness (Rom. 3:23). The difference between discipling churched and unchurched women lies in the state of the soil in which women are planted. One soil is nutrient-rich, having benefited from the Spirit’s work in and through the body of Christ. The other soil is hard and rocky. Places with unchurched soil often have layer upon layer of sin and strongholds, and people from unchurched soil will have hearts hardened by those many layers of sin in and around them. Because the Spirit’s life-giving stirrings have likely been absent for generations, life is neither visible nor sustained for any length of time. In Matt. 13, Jesus teaches about the nature of our discipleship efforts through the parable of the sower. Later to his disciples, Jesus explains that the four types of soil in his parable represent the four types of hearts or hearers his disciples could expect to minister to as they sought to fulfill his mission on earth. The first soil was hard, having been packed down by travelers and untilled for gardening. Jesus said this soil represents a heart hardened by sin. Gospel seeds cannot penetrate this heart, as evidenced by their lack of remorse. The second soil was shallow due to a hidden layer of rock beneath it. Jesus said this soil represented a heart that allows for superficial growth. 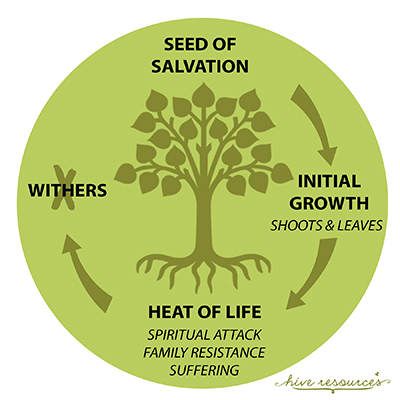 Gospel seeds penetrate and grow quickly, making the eventual plant appear healthy and fruitful. But because the plant is unable to grow hardy roots capable of penetrating the rocky layers beneath, it will quickly die. The third soil was riddled with thorns that sprang up to choke out growth. Jesus said this soil represented a heart riddled with worldly cares. And finally, the fourth soil was the only soil to be considered by Jesus to be “good soil,” representing a heart receptive to the gospel. Four soils, four different hearts. In developing a discipleship strategy targeting unchurched women, we are compelled to consider the type of soil in which we are ministering. As God has repeatedly planted our family in places with difficult soil, our family has learned to battle hard places, rocks, and thorns in fulfilling Jesus’ mission. In the places we’ve served, I have recognized the following lifecycle play out among new believers who have sprung up rocky soil (soil #2). Women who come to Christ out of rocky soil are often eager to accept the truth of the gospel and, for a time, appear to be spiritually healthy. Fresh from their salvation experience, these women will eagerly participate in the life of the church and shoots of growth are often evident. In their initial growth spurt they often show a desire to read God’s Word and to fellowship with his church. They will talk excited about their new-found feeling of peace and joy. But with an immature or non-existent root system, they cannot hope to endure the first onset of extreme circumstances. When the heat of life scorches their leaves, these women quickly wither away and die. 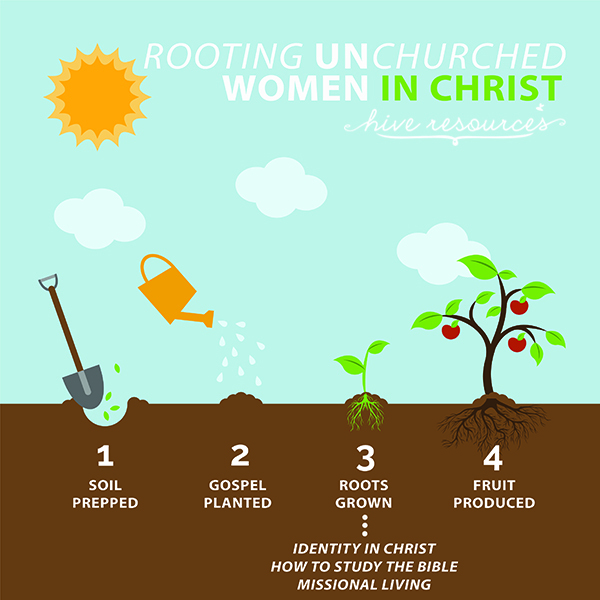 Because of the nature of the rocky soil in which they are planted, discipling unchurched women is first and foremost a root-building ministry. By God’s good design, roots are incredibly important for a plant. -They absorb water and nutrients from the soil. -They store food in preparation for extreme conditions experienced on the surface. -They anchor the plant and keep that plant in place. Now, there are several different types of root systems. (This really does relate to discipleship, so stick with me, here). The taproot system consists of one main root that is bigger and thicker than the others. It anchors the plant and can dig deep to find water. The fibrous system consists of many smaller, shallow roots that are intertwined and connected to each other. Grass is a good example of fibrous root system. So, with respect to women’s ministries, our discipleship looks like one of these two root systems. Too often, our discipleship looks like the fibrous root system. We offer events and fellowship-purposed programs in order to build connections with other women or meet felt-needs (love, acceptance, de-stressing, etc.,). But although quickly grown and quickly connected, fibrous roots are too shallow to keep a new plant firmly rooted when harsh conditions come her way. Connections with other women and fellowship is not enough to ground women in the church. In the plant world, the taproot system offers us a better model of discipleship. 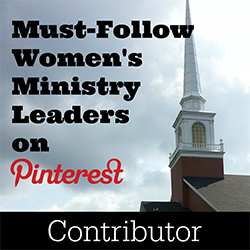 Ministries that are based on the Word will help women grow deeper and more stable roots. The Word of God is our sustenance, by it we know God, by it we grow to be like God, and by it we demonstrate fruit (Ps. 19; Matt. 4:4; 1 Pet. 2:2; 1 Tim. 4:6; 2 Tim. 3:16). When extreme conditions or storms come our way, we need roots deeply anchored in the Word and in truth. If we are anchored in truth, we won’t wither, we won’t die, and we won’t blow away. Deep and strong roots come only as the Spirit works in our lives through his Word to bring gospel growth and change to our heart. My friend *Pamela made a profession of faith, but when we spoke a few weeks later, I couldn’t help but notice that her smile looked like it was pasted on. I could see in her eyes that the positive emotions following her salvation experience had long since faded. A few questions and answers later, she shared she had recently endured a very difficult life situation (her first post-conversion experience with the heat of life). So I knew my spirit had discerned rightly; she was desperately trying to keep a smile on her face. To the observer, all the outward signs indicated Pamela was a healthy disciple. She was still attending church and she said she was reading her Bible and praying. But when pressed, it was her words that revealed the true state of her heart. In spite of her disclosure to me about her hard situation, Pamela indicated that her life had completely changed since she’d started coming to church and reading her Bible everyday – since she’d gotten her life together. Conspicuously absent was any mention of Christ. Now, please hear me clearly. Church attendance and Bible reading are good things, but instead of keeping our eyes fixed on Christ, we can too easily focus was on the work of our hands instead of Christ’s work in us. Human works are a poor substitute for biblical discipleship. Sensing that trouble was brewing below the surface of her life, I tried to get her plugged into a discipleship relationship. But my efforts came too late. The extreme circumstances she ha endured had already scorched her tender shoots of growth, and because she wasn’t deeply rooted in the truth of the Word, what little growth she’d enjoyed withered, and she soon stopped coming to church altogether. She was uprooted from her faith. In places with rocky soil, it is crucial that discipleship happens quickly after a seed has been planted and new life begins to grow. If you wait to help a woman build roots after extreme conditions set in, it is too late. Because she doesn’t have the benefit of the nutrient-rich soil of a church culture, an unchurched woman lacks the benefit of seeing lives of obedience mirrored to her, however imperfectly. So, while a new believer who has grown up in a churched culture might remain in the church out of habit or because she has learned to rely on the nutrients of someone else’s roots, an unchurched woman will not. An unchurched woman doesn’t know to do that. She will become uprooted, and as one of the many Barna studies about unchurched populations indicates, she will become de-churched. This is why discipleship – particularly for unchurched women – must first help women build a healthy root system, so that when the first storm of life hits and all those good feelings of salvation wear off (joy, peace, excitement), she will remain deeply rooted and nourished in the truths of the gospel. The key, then, to discipling unchurched women is starting early. As soon, as that seed of salvation takes root in a woman’s life, we must immediately start pouring into her. Because certain conditions have to be met in order for a new plant – or a new believer – to grow, thrive, bloom, and produce fruit. In what ways have you seen this lifecycle play out in the women around you? Next week we will look a three specific ways we can build better roots in an unchurched disciple. *not her real name, of course.